Jacob Rees-Mogg had a talk for the Oxford Union, published on YouTube on 2013-11-11. The Oxford Union is a debating society. A debater’s aim is to win the audience over and not necessarily to discuss truth. Rees-Mogg had an entertaining talk but it is not targeted at discerning truth indeed. His presentation comes across as modest and forceful, with the charm of perhaps some old-fashioned style. Who closely considers his words may however be shocked by the unreasonableness and closed-mindedness. Boris Johnson and Nigel Farage have been criticised for spreading false arguments for the June 23 2016 Brexit referendum. Obviously, these two individuals cannot be held accountable for swinging the views of some 45 million voters. I wondered since the referendum whether they had had some help. Apparently Jacob Rees-Mogg had been giving a helping hand. To clarify Rees-Mogg’s departure from truth, we first must mention some properties of the European Parliament. The EU Parliament has 751 seats, distributed over 28 member states with 500 million people. The distribution over countries is not proportional to the populations, since countries are units by themselves, and it is felt that this should have some effect. Thus Germany with its population of 82 million has 96 seats (1.17 seats per million), the UK with its population of 65 million has 73 seats (1.12 seats per million), and Malta with its population of 0.5 million has 6 seats (12 seats per million). There is relatively little tension about this apportionment, since the countries fall in comparable classes (large, medium, very small), and the major political differences translate into political parties. The divisions between Christian Democrats, Social Democrats, Liberals, and what have you, apparently are dispersed over countries in similar manner, or, the political parties are able to create alliances over nations. It is part of the wonder of the EU that nationalism is being channeled and that there is more scope for civil democracy. A recent paper of mine on proportional representation is here. Jacob Rees-Mogg does not explain above democratic solution for dealing with Member States of different sizes. He criticises the EU that Malta is over-represented compared to the UK. It is a fact that Malta has a higher seat-to-vote ratio, but only pointing to this fact obscures the other considerations. He mentions a perhaps older figure of 15 instead of the current 11, but that is irrelevant here. The demagoguery is that many in his audience apparently are not be aware of the key notions in this apportionment, and he apparently takes advantage of their lack of knowledge to win them over to his own closed-mindedness. The demagoguery is that he creates a suggestion as if Malta has 15 times more influence than the UK, as if 6 is 15 times larger than 73 (as, indeed, 6 = 15 * 73). Does it really require a protest ? The situation w.r.t. the UK and Malta in the EU Parliament has been explained. The UK has District Representation (DR) instead of Proportional Representation (PR), which causes that the UK is much less democratic than most countries in the EU or the EU Parliament itself. The PR Gini for the UK of 2017 is 15.6%, but there has been a lot of strategic voting, so that we don’t really know what the first preferences of UK voters are. By comparison, Holland has a PR Gini of only 3.6%, and people in Holland could vote for the party of their first choice. See this weblog text and this paper. I tend to think that Rees-Mogg really worries about the state of democracy, while A.C. Grayling rather sees an elitist or even pecunary motive, see this article, as in “follow the money”. Yet Rees-Mogg doesn’t study the topic, and thus he is condemned to repeat an ideology. He studied history but not science. His voting track record apparently shows that he consistently voted against Proportional Representation. Old-fashioned hypocrisy apparently is also part of his old-fashioned style. October 18: In memoriam Daphne Caruana Galizia (1964 – 2017), journalist, killed by a car bomb. This weblog entry copies the earlier entry that used an estimate. Now we use the actual YouGov data, below. Again we can thank YouGov and Anthony Wells for making these data available. The conclusions do not change, since the estimate apparently was fairly good. It concerns a very relevant poll, and it is useful to have the uncertainty of the estimate removed. Two conditions for the application of Lorenz curve and Gini coefficient to voting and allocated seats, MPRA 80297. Brexit stands out as a disaster of the UK First Past The Post (FPTP) system and the illusion that one can use referenda to repair disproportionalities caused by FPTP. This information about the real cause of Brexit is missing in the otherwise high quality overview at the BBC. 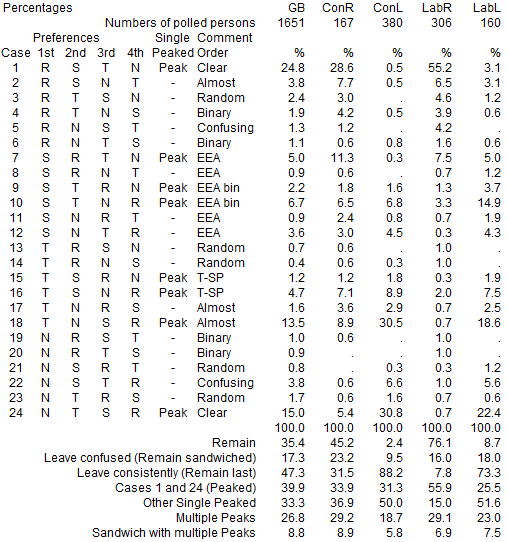 The former weblog text gave an overview of the YouGov polling data of June 12-13 2017 on the Great Britain (UK minus Northern Ireland) preference orderings on Brexit. The uncertainty of the estimate is removed now, and we are left with the uncertainty because of having polling data. The next step is to use these orderings for the various voting philosophies. I will be using the website of Rob LeGrand since this makes for easy communication. See his description of the voting philosophies. Robert Loring has a website that referred to LeGrand, and Loring is critical about FPTP too. However, I will use the general framework of my book “Voting theory for democracy” (VTFD), because there are some general principles that many people tend to overlook. 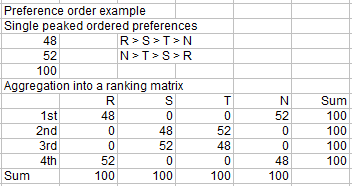 See the former entry for the problem and the excel sheet with the polling data of the preferences and their weights. LeGrand’s website requires us to present the data in a particular format. It seems best to transform the percentages into per-millions, since that website seems to require integers and we want some accuracy even though polling data come with uncertainty. There are no preferences with zero weights. Thus we get 24 nonzero weighted options. We enter those and then click on the various schemes. See the YouGov factsheet for the definition of the Brexit options, but for short we have R = Remain, S = Soft / Single Market, T = Tariffs / Hard, N = No Deal / WTO. Observe that the Remain options are missing, though these are important too. The basic situation in voting has a Status Quo. The issue on the table is that we consider alternatives to the Status Quo. Only those options are relevant that are Pareto Improving, i.e. that some advance while none lose. 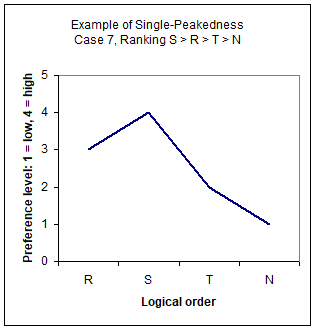 Commonly there are more Pareto options, whence there is a deadlock that Pareto itself cannot resolve, and then majority voting might be used to break the deadlock. Many people tend to forget that majority voting is mainly a deadlock breaking rule. For it would not be acceptable when a majority would plunder a minority. The Pareto condition thus gives the minority veto rights against being plundered. In this case the status quo is that the UK is a member of the EU. The voters for R block a change. The options S, T and N do not compensate the R. Thus the outcome remains R.
This is the fundamental result. The philosophies in the following neglect the status quo and thus should not really be considered. PM 1. Potentially though, the S, T and N options must be read such that the R will be compensated for their loss. On LeGrand’s site we get Plurality as the first step in the Hare method. R gets 35% while the other options are divided with each less than 35%. Thus the outcome is R.
When we continue with Hare, then R remains strong and it collects votes when S and N drop off (as it is curiously sandwiched between options for Leave). Eventually R gets 45.0% and T gets 55.0%. Observe that this poll was on June 12-13 2017, and that some 25% of the voters “respect” the 2016 referendum outcome that however was flawed in design. I haven’t found information about preference orderings at the time of the referendum. Borda generates the collective ranking S > T > R > N. This is Case 9 in the original list, and fortunately this is single-peaked. 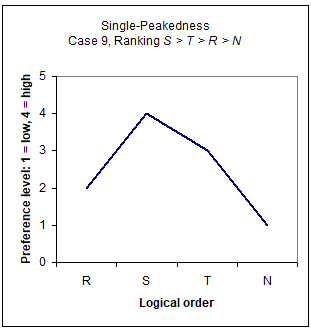 Using Copeland, we find that S is also the Condorcet winner, i.e. wins from each other option in pairwise contests. This means that S is also the Borda Fixed Point winner. The major point of this discussion is that the status quo consists of the UK membership of the EU. Part of the status quo is that the UK may leave by invoking article 50. However, the internal process that caused the invoking of article 50 leaves much to be desired. Potentially many voters got the suggestion as if they might vote about membership afresh without the need to compensate those who benefit from Remain. Jonathan Portes suggested in 2016 that the Brexit referendum question was flawed in design because there might be a hidden Condorcet cycle. The YouGov poll didn’t contain questions that allows to check this, also because much has happened in 2016-2017, including the misplaced “respect” by 25% of the voters for the outcome of a flawed referendum. A key point is that options for Remain are not included, even though they would be relevant. My impression is that the break-up of the UK would be a serious issue, even though, curiously, many Scots apparently rather prefer the certainty of the closeness to a larger economy of the UK rather than the uncertainties of continued membership of the EU when the UK is Leaving. It would make sense for the EU to encourage a reconsideration within the UK about what people really want. The Large Hadron Collider is expensive, but comparatively it might be less expensive when the UK switches to PR, splits up its confused parties (see this discussion by Anthony Wells), and has a new vote for the House of Commons. The UK already has experience with PR namely for the EU Parliament, and it should not be too complex to use this approach also for the nation. Such a change might make it also more acceptable for other EU member states if the UK would Breget. Nigel Farage much benefited from Proportional Representation (PR) in the EU Parliament, and it would be welcome if he would lobby for PR in the UK too. Nevertheless, given the observable tendency in the UK to prefer a soft Brexit, the EU would likely be advised to agree with such an outcome, or face a future with a UK that rightly or wrongly feels quite maltreated. As confused as the British have been on Brexit, they might also be sensitive to a “stab-in-the-back myth”.